This is Part 2 in a Series. Read Part 1 HERE. 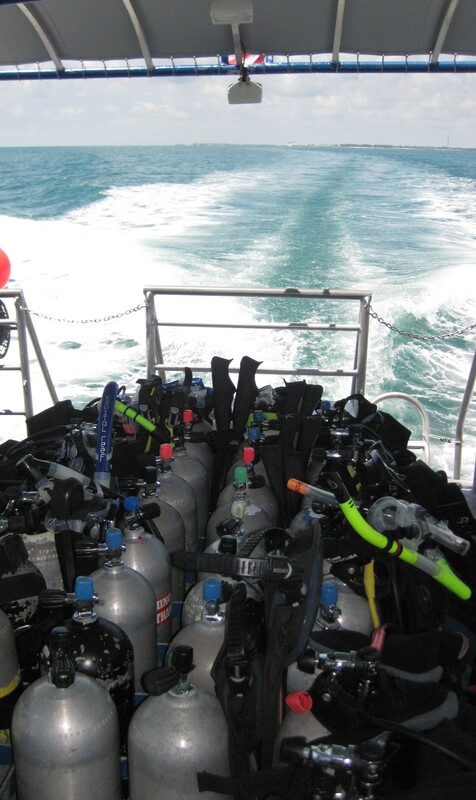 Did I mention how terrified I am to scuba dive? No? Well, rest assured that I told my instructor. And Zach. 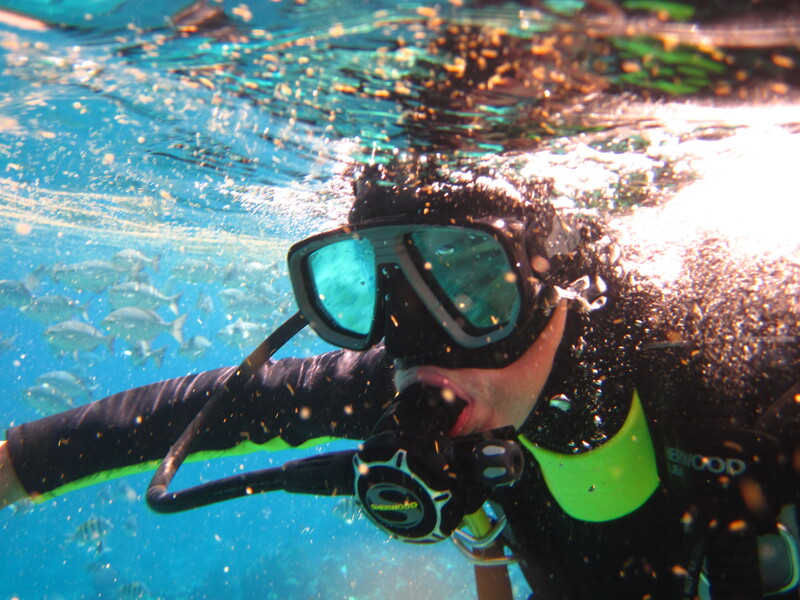 And Kate, the other student diving with us. Here I am, yesterday morning, having problem after problem with pool gear. Mask too tight, respirator too difficult to breathe through, can’t get properly weighted. Bleh. Still. Not giving up yet. 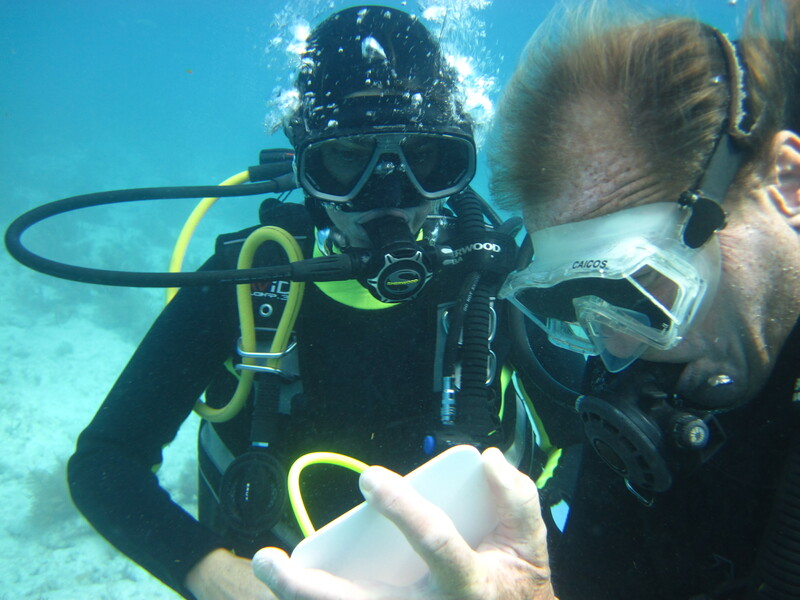 Then we spent time calculating nitrogen concentration in one’s body, safe dive times, etc. I liked this because it was math-y, and also showed that dive sickness is avoidable, and not just a matter of chance circumstance. 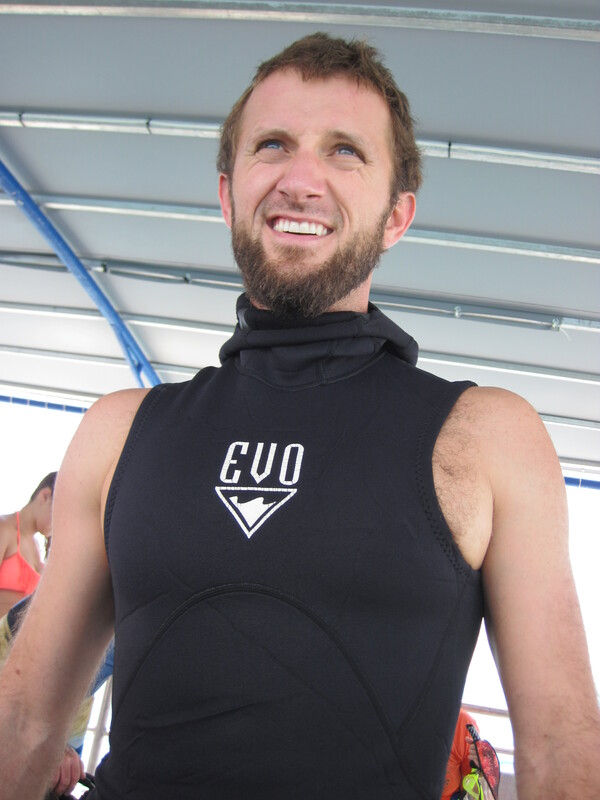 We got onto the boat for a 40 minute ride out to Sand Key, part of the coral barrier reef 7 miles from Key West. I cannot imagine a prettier day on the water. 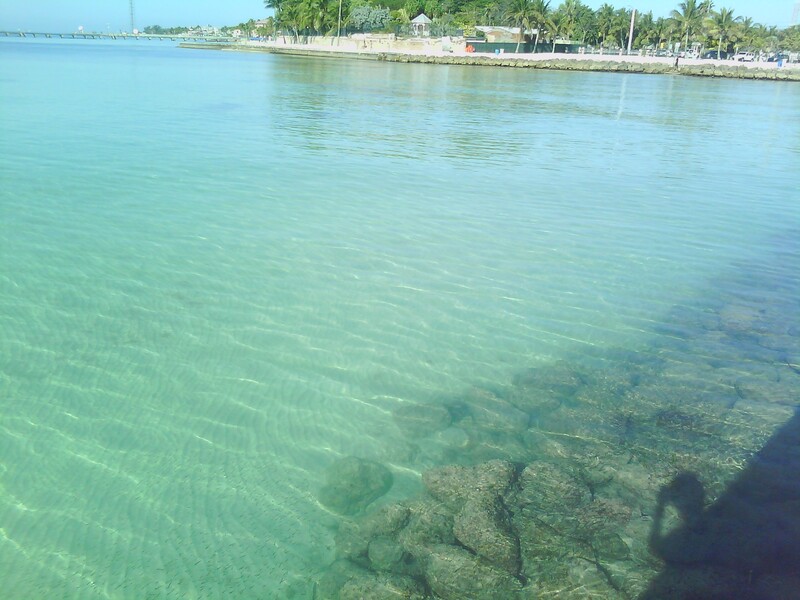 Calm and glassy and teal. The crew had the tanks all lined up. 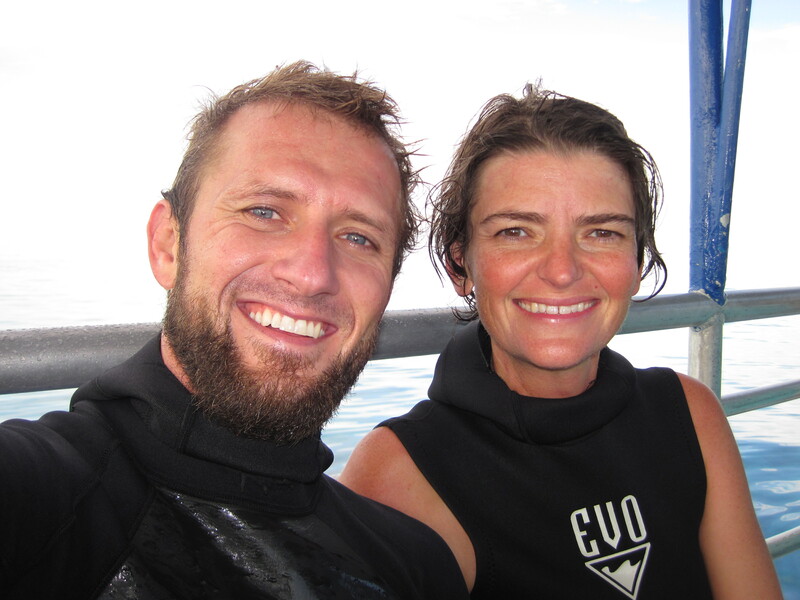 We squeezed into wetsuits and hoods. This is Zach making his “THIS IS AWESOME” face. This was the view off the side of the boat. Those greeny patches? They’re corals 20 feet below. I clutched the rope, all the way down to 5 feet, adjusting and readjusting my mask, my respirator, and finding all my gauges. 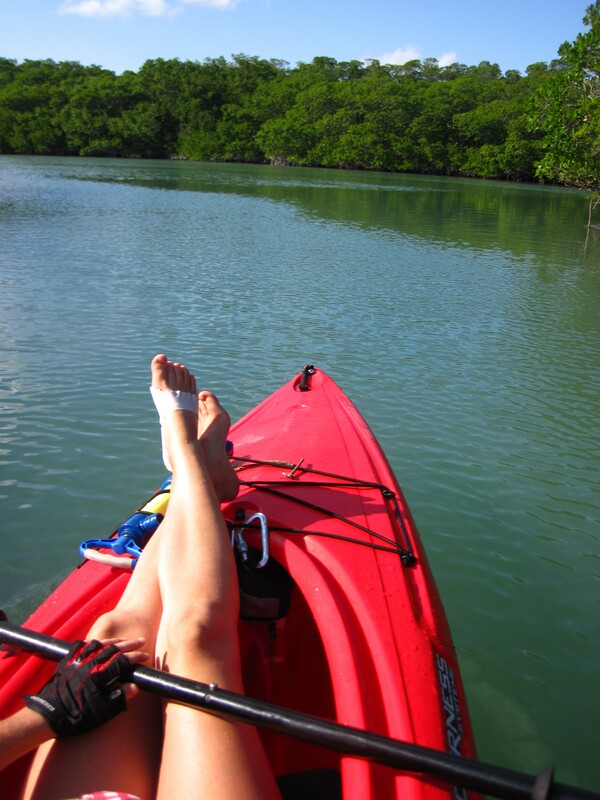 I hovered there with Duane, the instructor, while Zach sort of paddled around nearby, getting his bearings. 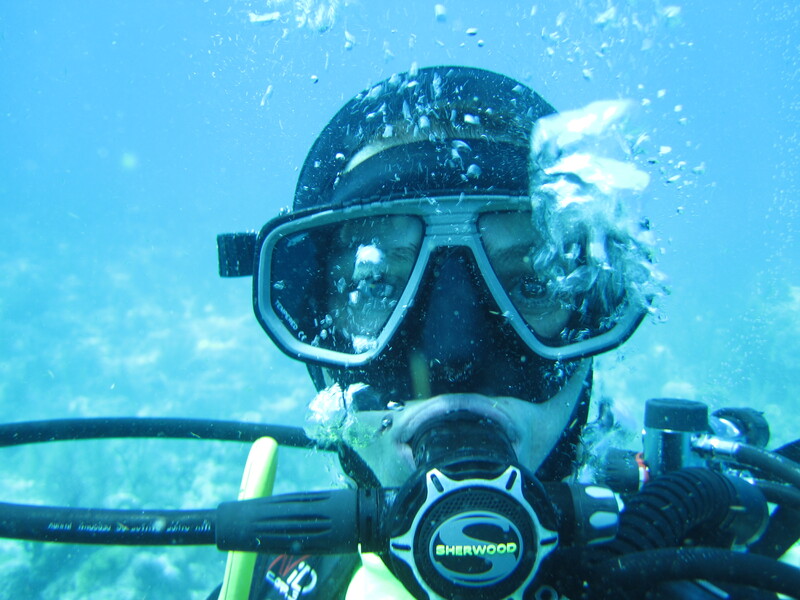 I realized I needed to cry, and then prompltly discovered that there is no crying in scuba diving. I surfaced, jittery, breathed a bit (but didn’t cry! ), then went back down. Slowly, slowly descending to 16 ft, whimpering and grasping at my teacher’s jacket, bug-eyed with terror. It took me ages to relax and let go of that rope, and then I was only willing to swim in circles around it. 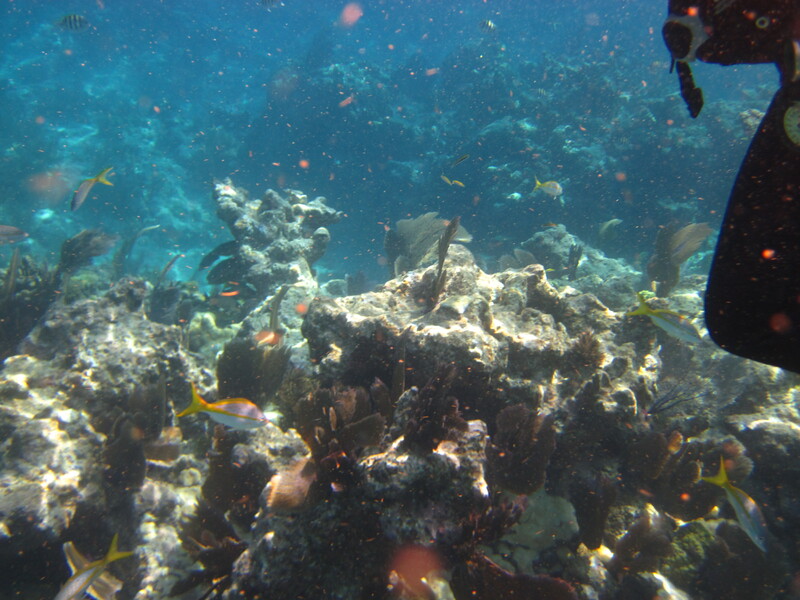 Finally, I calmed down and we set off to see all sorts of fishies and corals. 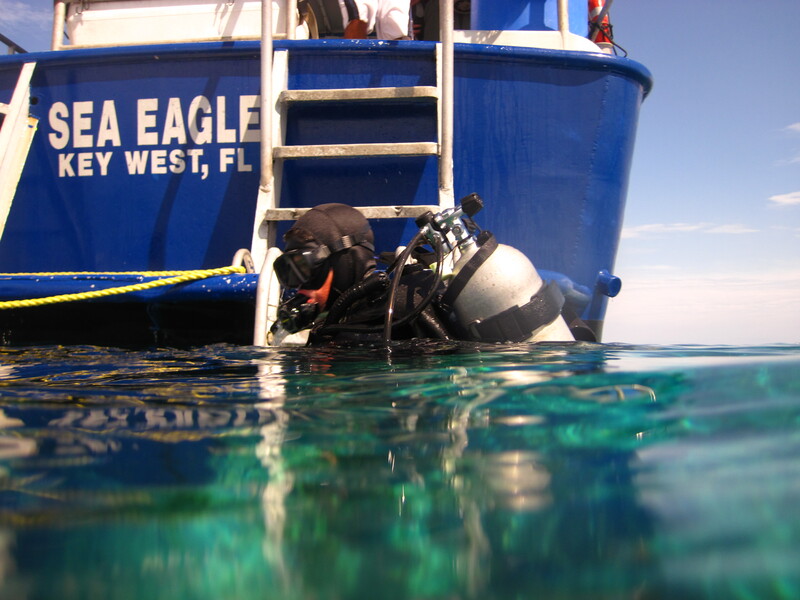 We surfaced and I said something I never thought I’d say “I didn’t want to come back up.” We climbed aboard the Sea Eagle and the crew switched up our gear for fresh tanks. Then we cruised to our next spot. I noticed that my hands were really itchy and tingly. Duane said this was from hydra stings and fire corals that grow on the ropes. A good lesson…I won’t be clutching the rope next time. 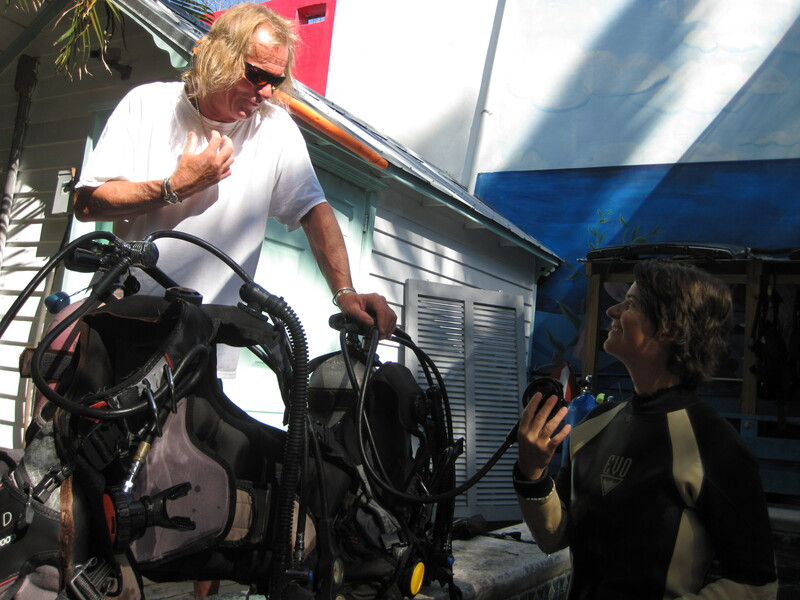 The second plunge was much easier, though I still asked Rick for a tiny push; it’s psychologically pretty difficult to jump in with that much gear on. It just seems impossible that you’re going to float. 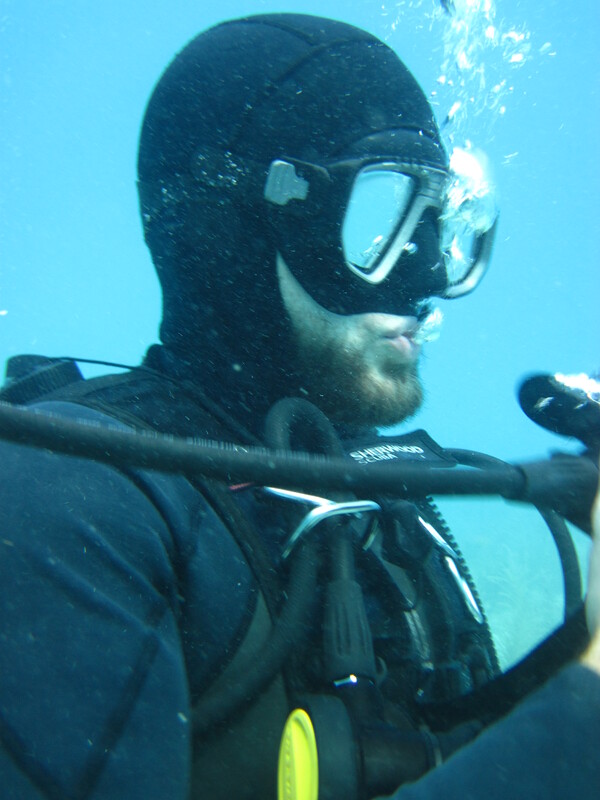 On this dive I got comfortable faster, and did my own drills of taking out my respirator, tossing it behind me, relocating it, and putting it back it. Then we just cruised and swam and took pictures of pretty things. 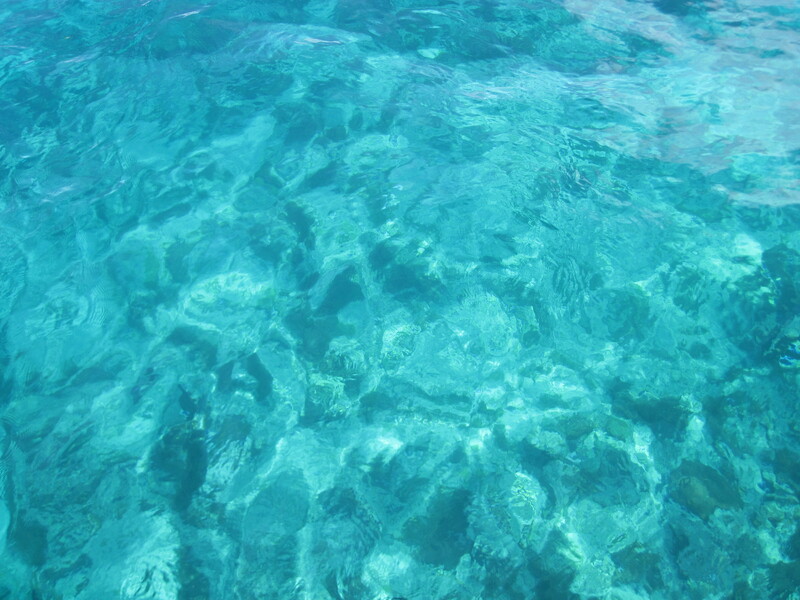 Our coral reef is gorgeous. I didn’t think I could do it, truly. 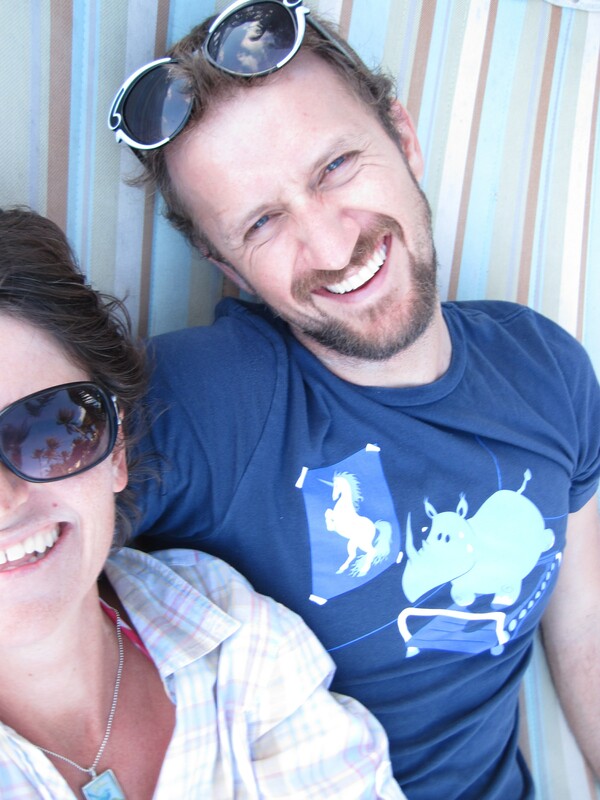 Zach says he knew I was capable, despite all my worries, because he’s seen me work through all kinds of fears. A brave new adventure! 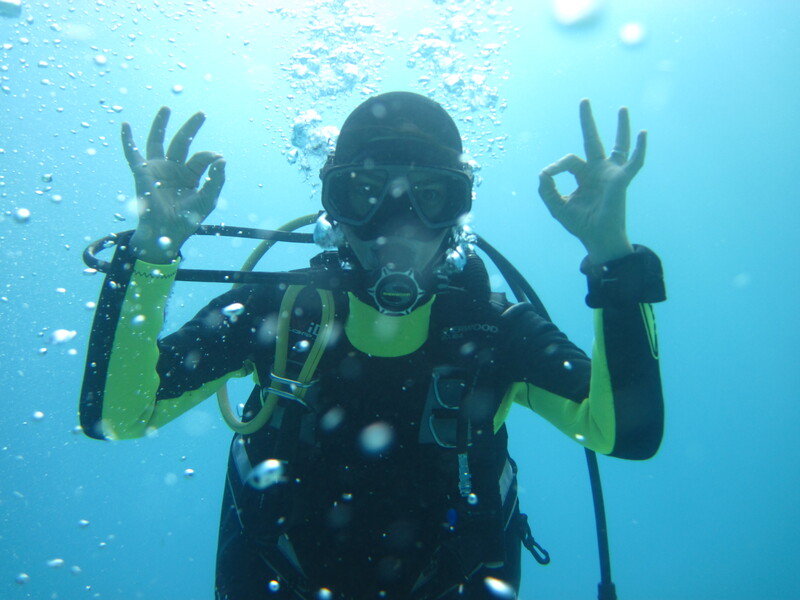 Two more dives next week, then I’ll be a card-carrying, PADI-certified open water diver. This time, I can’t wait to go back under. Zach was glad to send his 20s off with a bang. Happy 30th birthday today, mister! 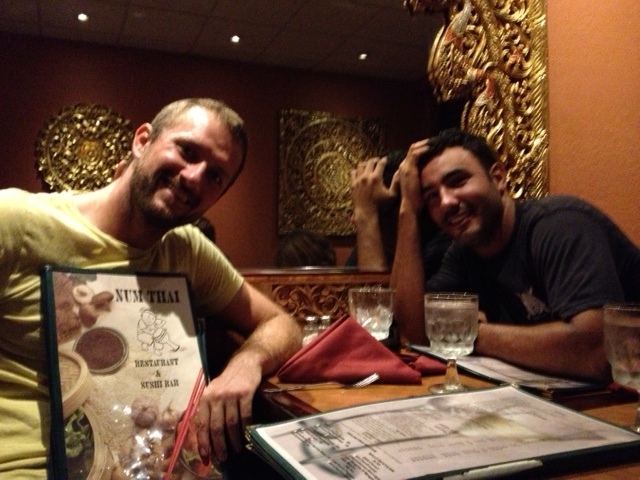 Later, dinner at Num Thai with Zach and Daisson. 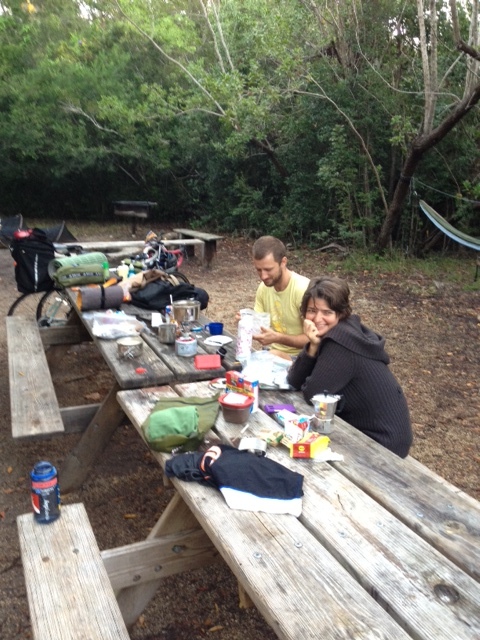 Chilly morning at the campground! 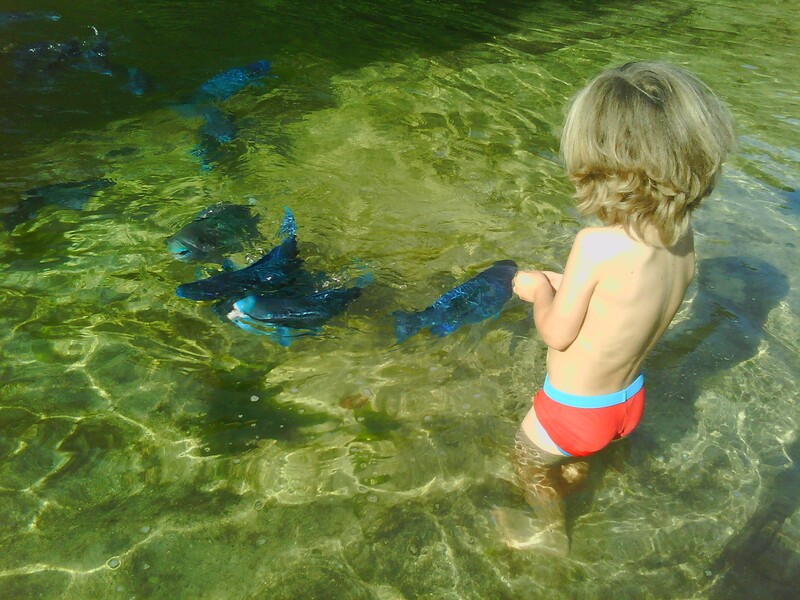 After camping, the day warmed up and the Boogedy and I fed the Indigo Parrotfish at Theater of the Sea in Islamorada. This was AWESOME. They swam between our legs and ate from our hands. These were the prettiest fish I have ever seen. In January we went to DisneyWorld in Orlando (details tomorrow). Before heading to the theme park each day, we headed to Starbucks because the coffee at DW was….unsatisfactory. 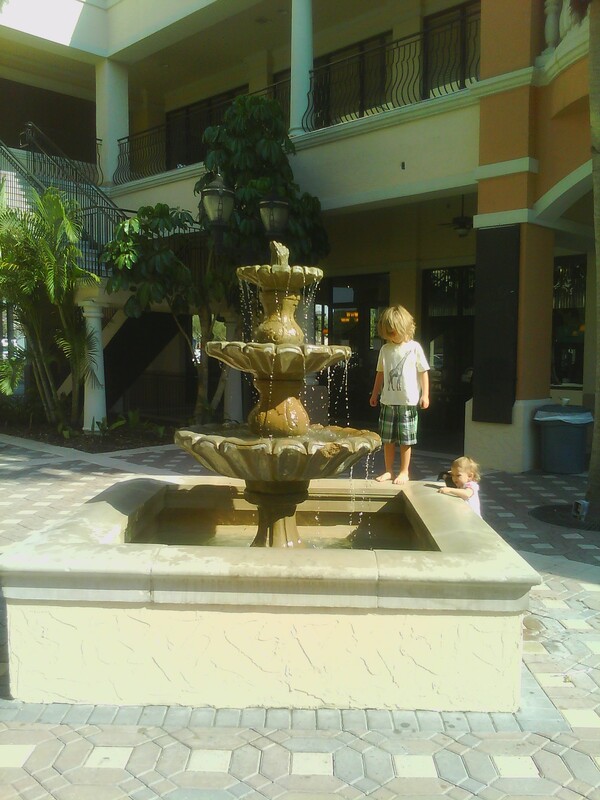 On this sunny morning, we sat outside the coffee shop while the Boogedy pulled pennies from the fountain. He handed them to this baby so that she could have fun throwing them back in. Such a nice boy. The McDonalds in Orlando had an awesome playland, which the our kid saw from the car and begged to visit. 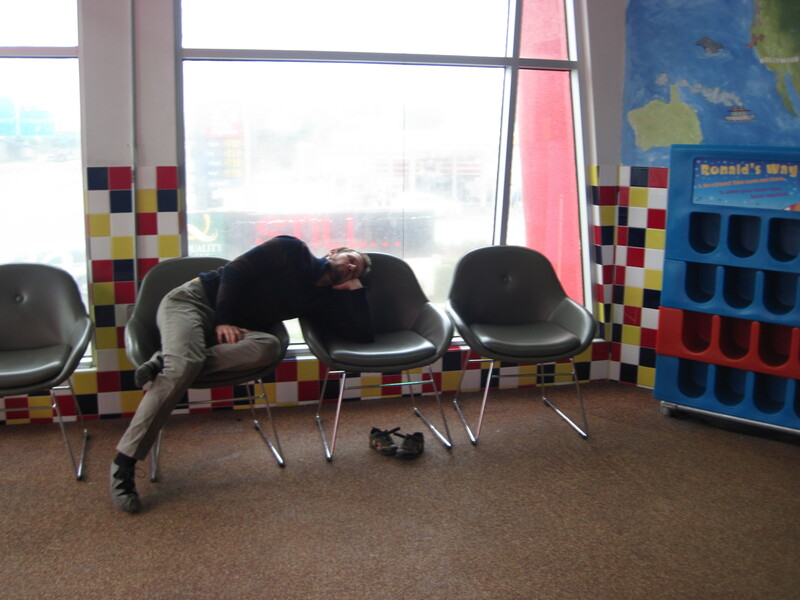 Here is Zach, asleep near the shoe cubbies. 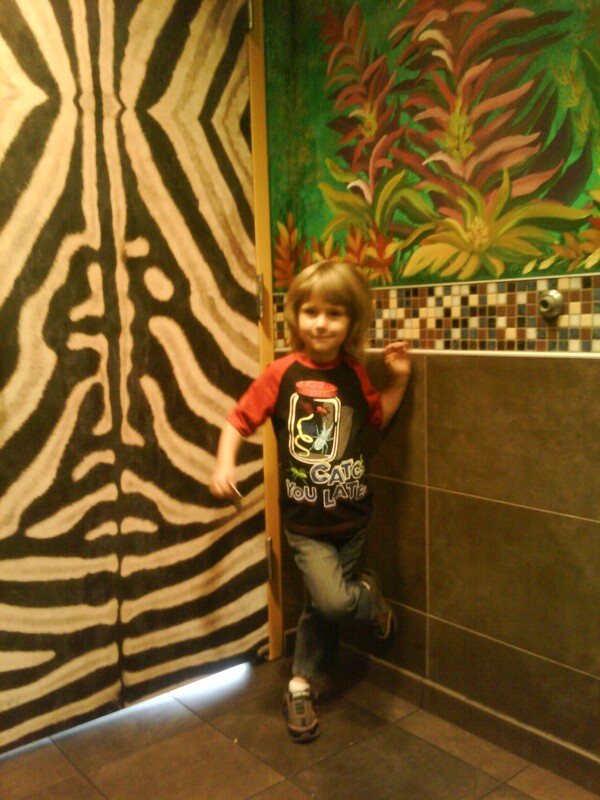 And here is the Boogedy, in the coolest McDonalds bathroom ever. 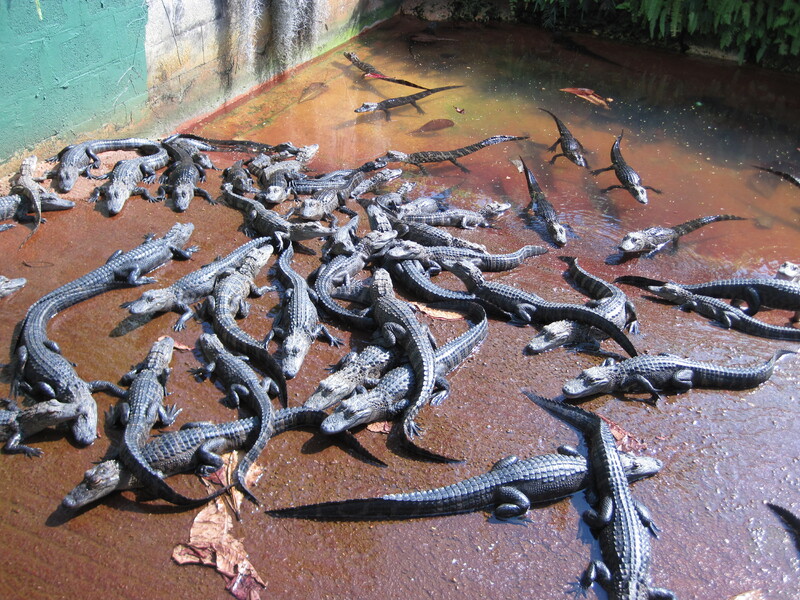 When I saw these alligator babies (maybe 2 ft long) I thought of my niece, Rachel. As a young teenager, she once expressed the absolute WILLIES about the koi store where the fish swam slick and slippery all over each other! She couldn’t control the shudders. Then just last weekend, while on our own kayaking trip in the upper Keys, we stopped for lunch at Habanos, a yummy Cuban restaurant in Islamorada. 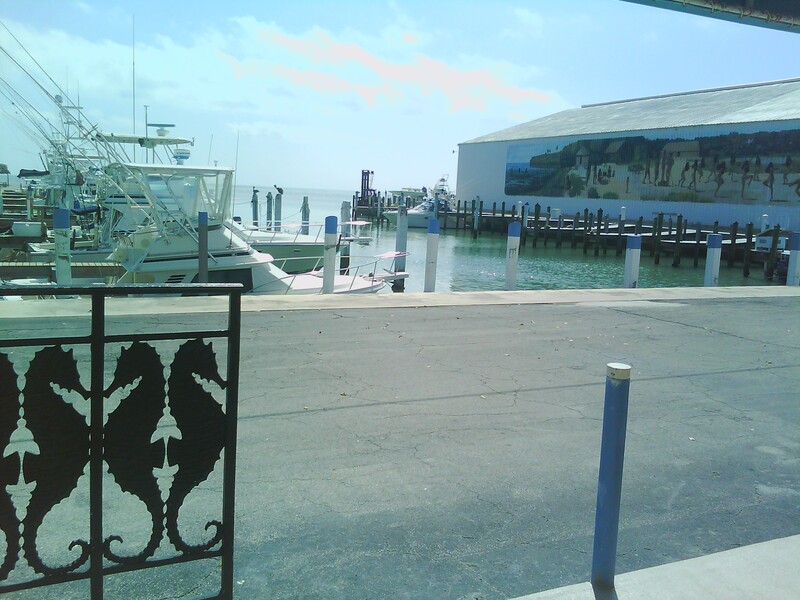 This is the view of the marina and mural from our table. I love the fence. 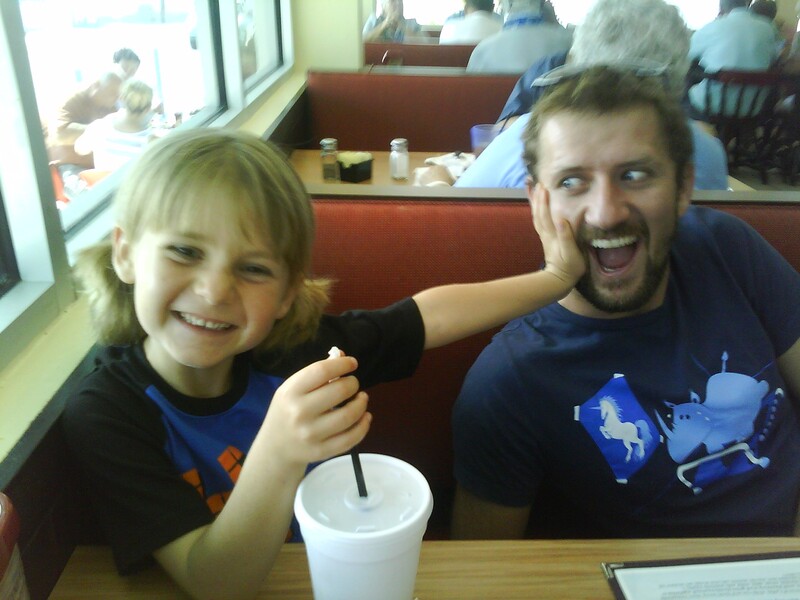 Here is the view of my boys, horsing around at the table. I love these goofballs. 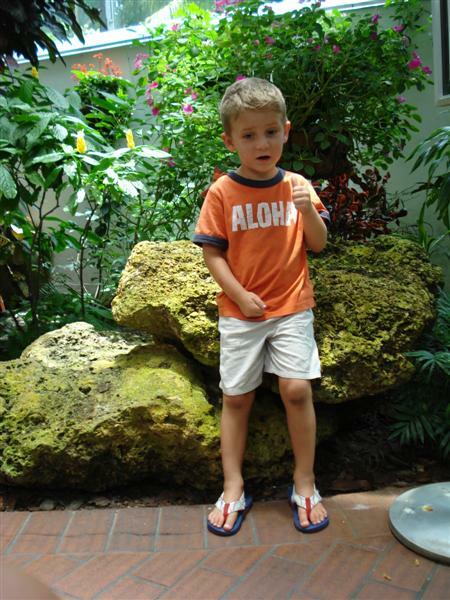 I volunteered to go to Key West Botanical Garden on a kindergarten field trip with my kids’ class. 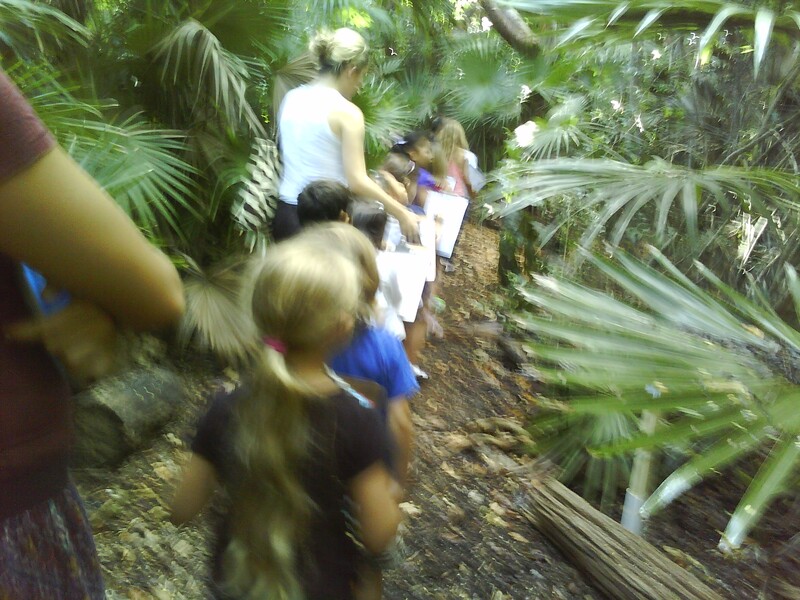 I didn’t realize we were going so the children could look for and identify native SPIDERS. I found one with the back of my neck. *shudder* I hope you’ll forgive my shaky camera work. The Atlantic Ocean was like a lake that day. 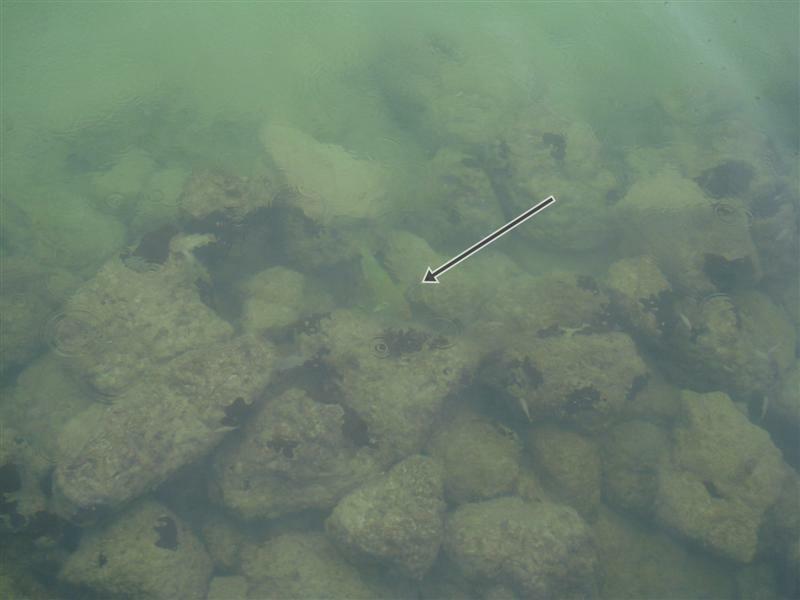 Here is the view down into the rocks of the White Street Pier. I saw a dad with a little boy; the kid was on a cell phone telling his mom about all the kinds of sea creatures he could see from the pier today. Winter means that Debby comes down from Maryland and gives me classes in glass beadmaking! 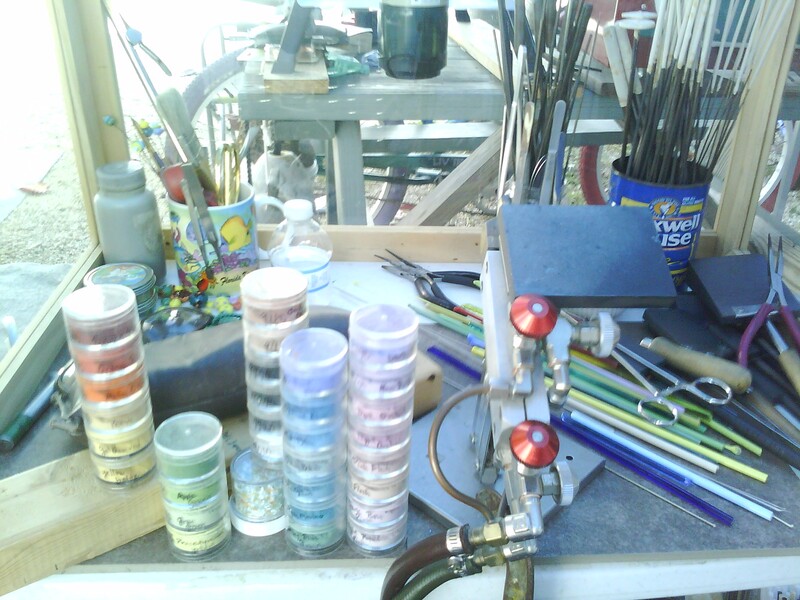 Here’s the view of my workspace with the blowtorch, mandrils, glass rods, and all kinds of cool supplies she was showing off! 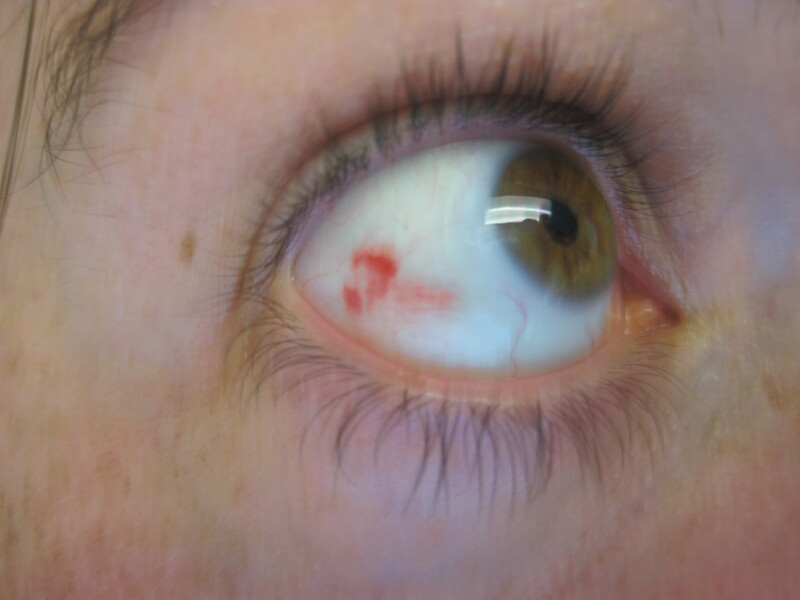 Unrelated: somehow I blew a blood vessel in my eye. Didn’t hurt, but it looked like it did. The Boogedy rides for joy, now, and wants to use the bike to go everywhere. He got this new big-boy bike for xmas and I just bought him his own rear- and headlights as well as a cable lock. He was thrilled that he got to choose his own combination. 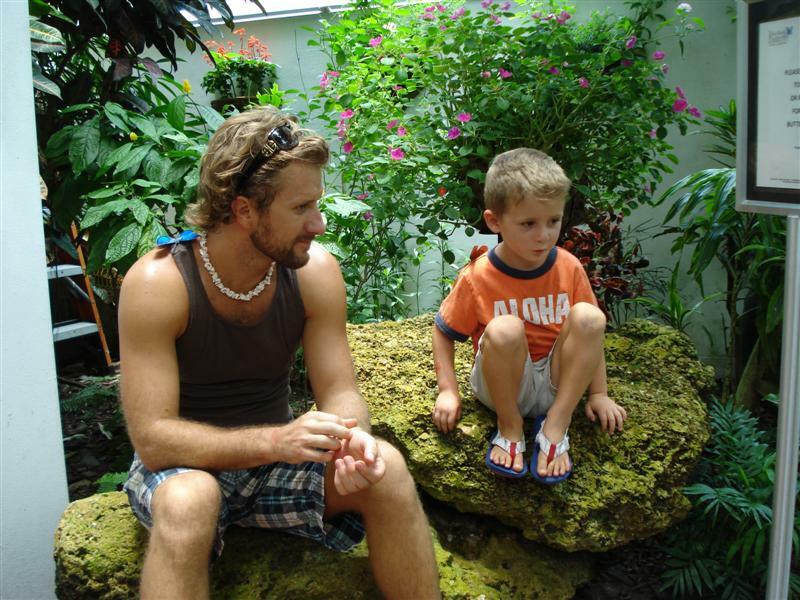 Part of Zach’s job with his adventure travel company is tour development and research. 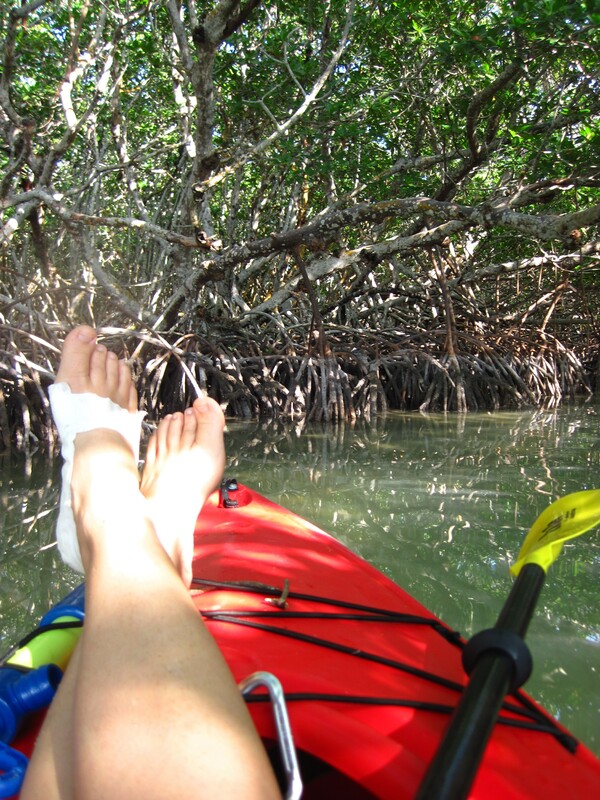 So Saturday Zach and I took the Boogedy up to mile marker 77 to Robbie’s to experience a true Keys Adventure: kayaking through the mangrove tunnels. 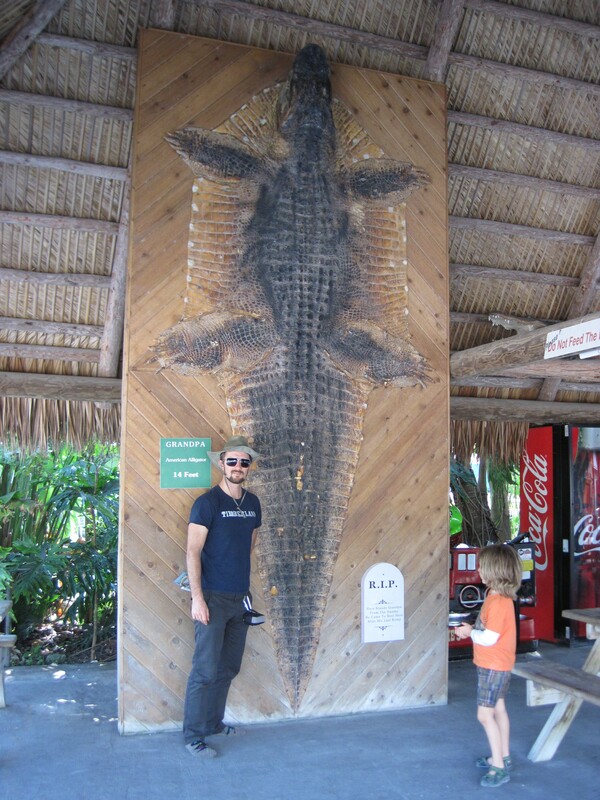 Even though I’ve lived in the Keys for 2 years, this is the first time I have gone! 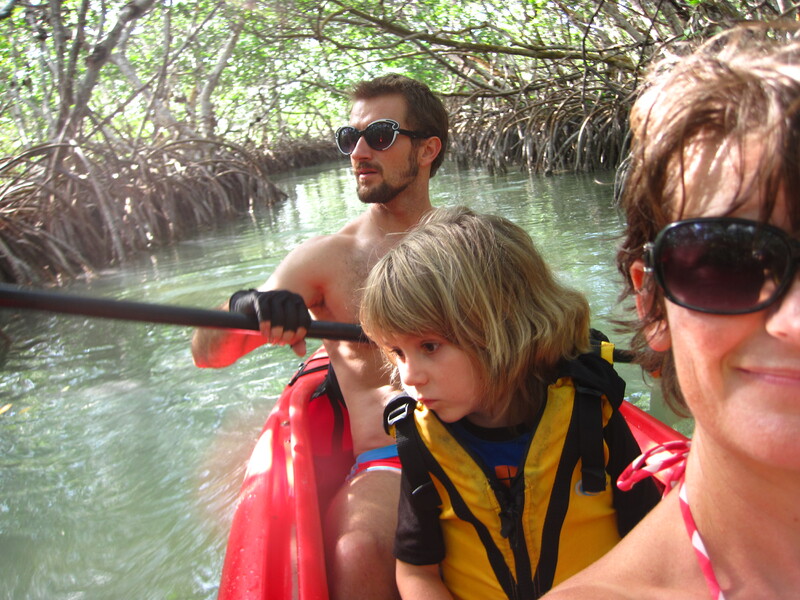 Mostly I just let Zach paddle while I relaxed and tried not to think about the crabs crawling on the branches overhead. 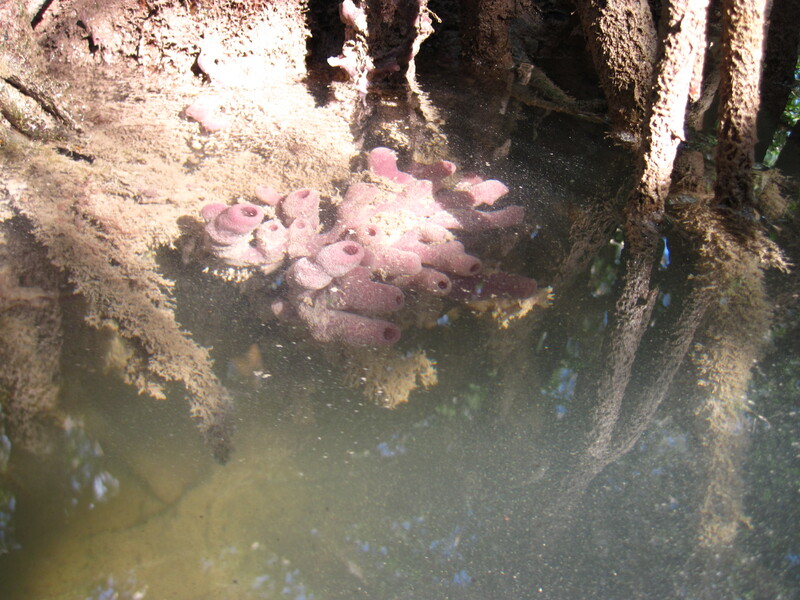 The tide was really low and we saw purple squishy sea sponges growing amongst the roots. I snapped a bunch of pictures, only to find that most contained two whole boys and half of my own face. I caused a bunch of anxiety for this beautiful bird by standing up in my kayak to take his photo, but he never flew away. Oh look, just half of Zach’s face! 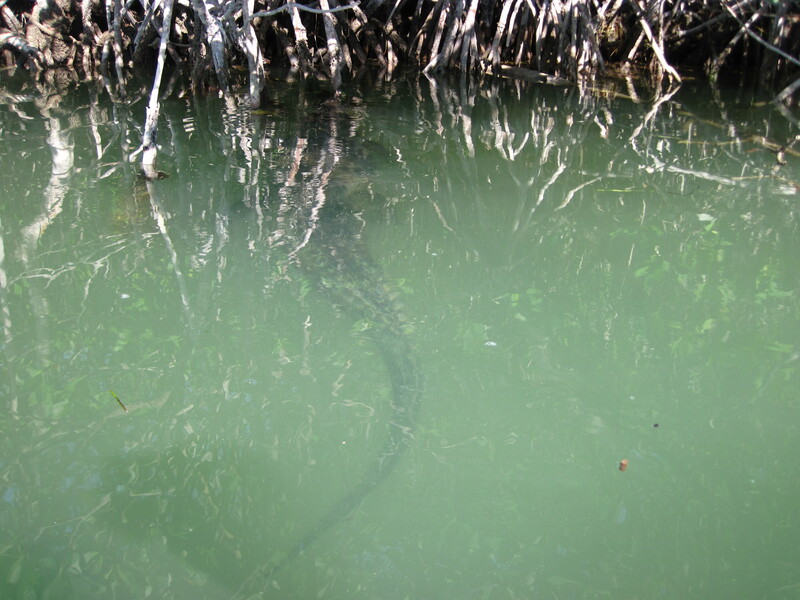 We caught sight of a small (4.5 ft) endangered American crocodile. 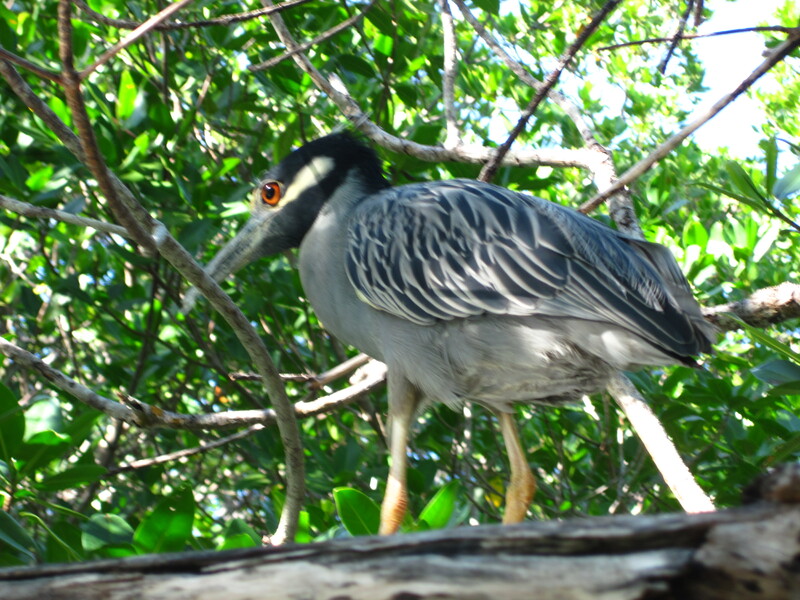 We followed him through the mangroves, while he gave us the side-eye. Then, he bumped into a root and spooked himself and submerged with a splash. I hadn’t been on the water since we capsized a hobie cat way back in September, and it was NICE. Truly relaxing, sunny, warm. 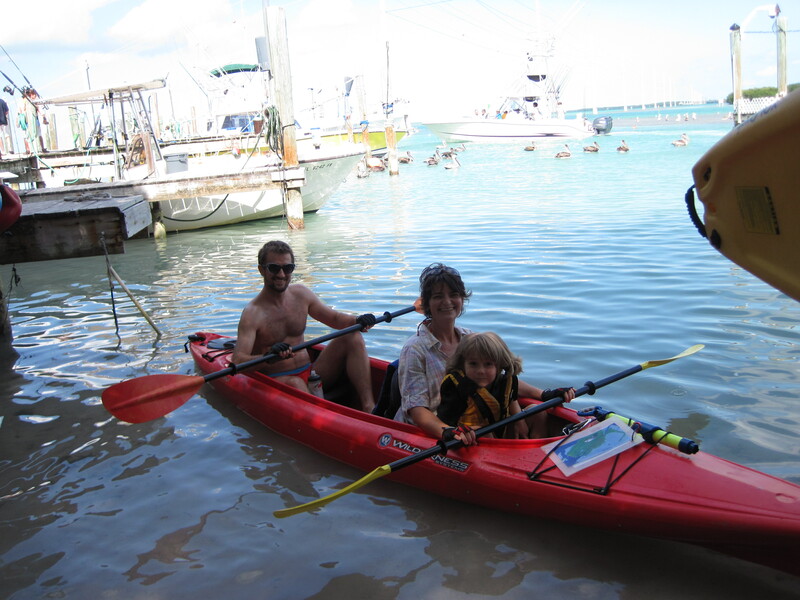 All the things people come to the Keys to experience at this time of year. 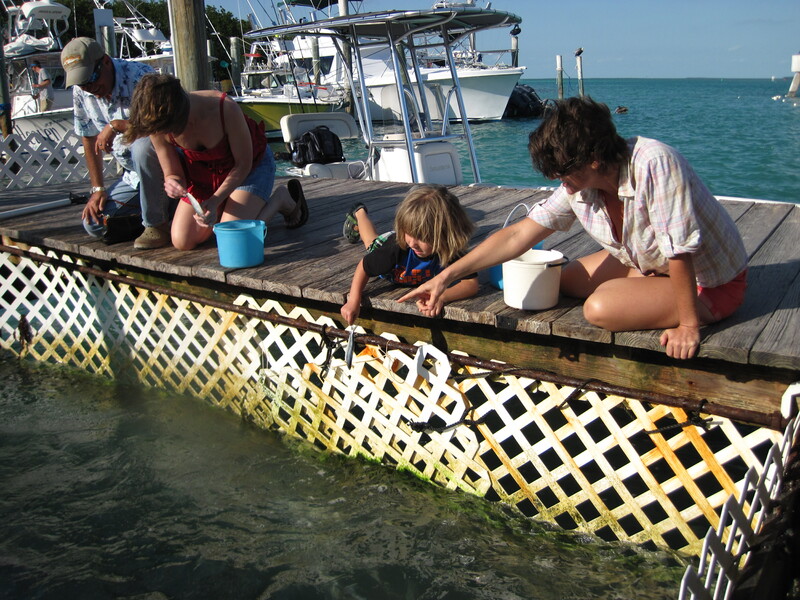 We bought several buckets of fish to feed to the Tarpon, massive (5-8 ft long) game fish that live near the marina. You have to be careful because they jump out of the water and open their huge mouths and they will bite your hands. They don’t have teeth, but Zach can testify that they still scrape. After kayaking, we headed back toward Key West and stopped to check out a hotel that Zach may have guests stay at during their Keys Adventure. 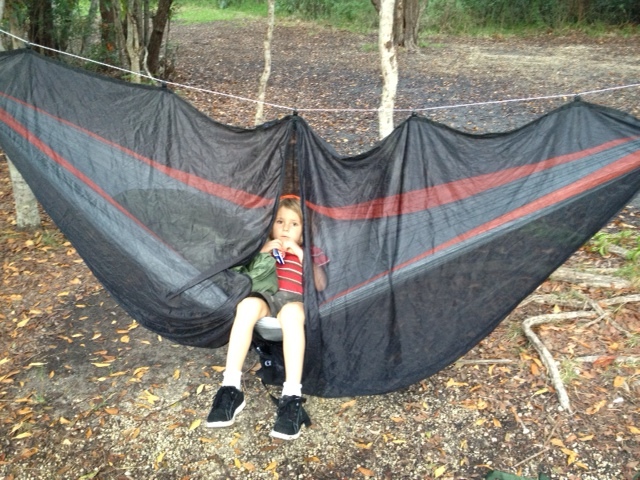 We laid in their hammock for quite a while, while the Boogedy played on the playground. I love the palm trees reflected in our sunglasses. We stopped for a round of night-golf at Boondocks. I love the landscaping here. 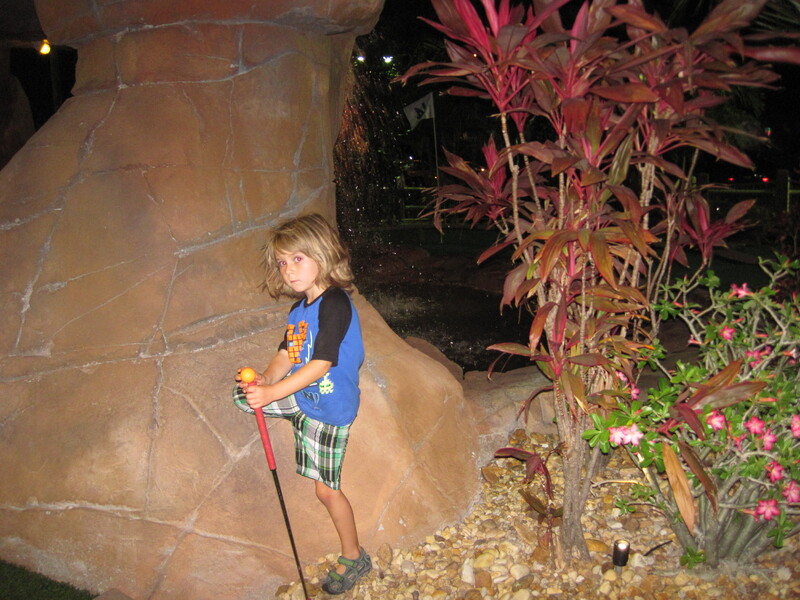 Mini-golf has become a staple for family activities and we usually hit a course whenever we travel. On Sunday, our neighbors had organized a community barbeque in our shared garden. J&B grilled ribs and a whole chicken, as well as some herbed veggies. I brought a huge salad with red onions, pears, and blue cheese, and made a balsamic vinaigrette with shallot and mustard. There were lots of other potluck items, and I think everyone was a little surprised at how much of the cherry pie I ate! That fakey ruby red cherry pie filling is some kind of a weakness for me, and I just can’t resist. It was such a lovely weekend! 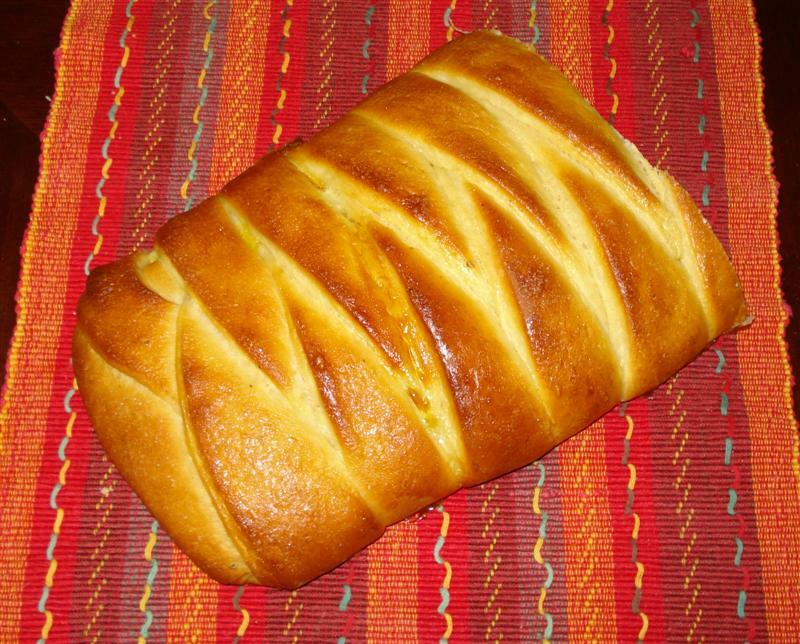 I made a delicious braided bread braid filled with sweetened cream cheese and homemade lemon curd a few weeks back. I shared some with Paige because it was too pretty to keep to myself. The recipe is from Smitten Kitchen, one of my favorite websites for great food. 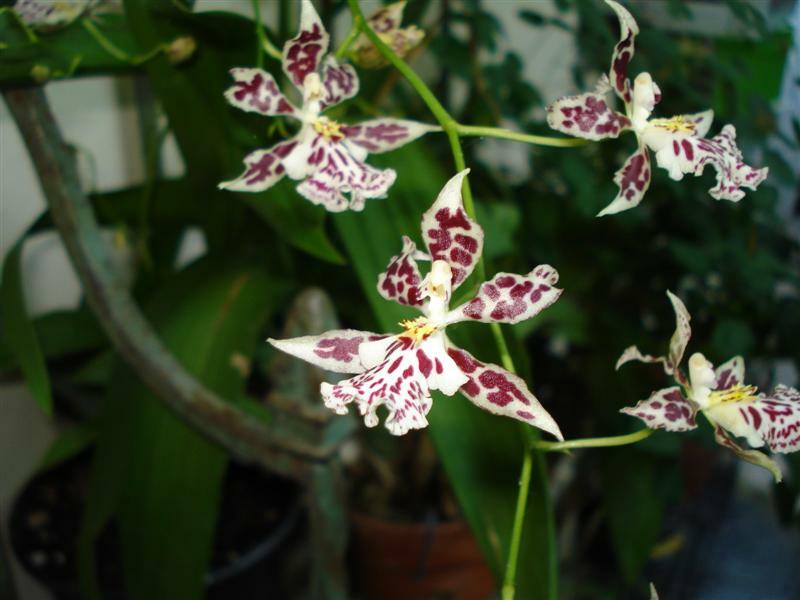 Here are the spotty orchids currently in bloom by my front door. 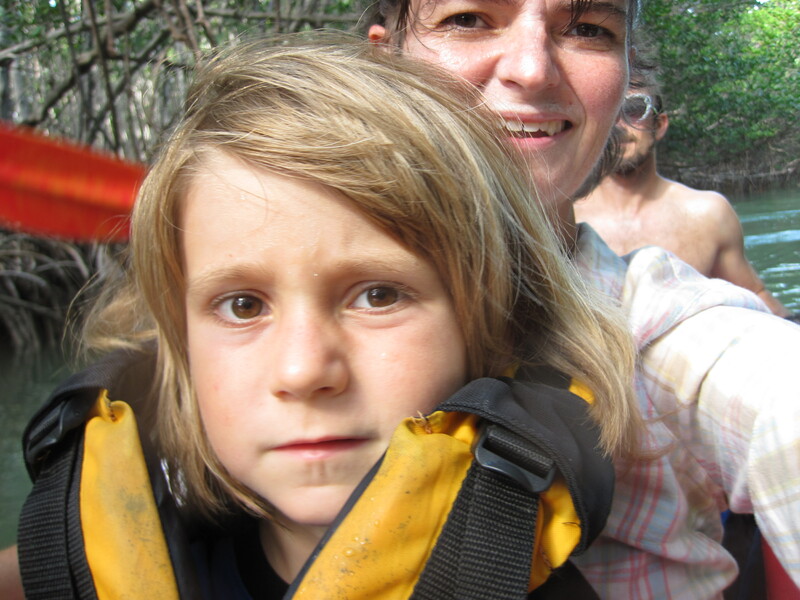 I took the kid and dog to the playground 3 or 4 nights ago and stood on a fire ant hill. Fire ant bites form pustules that sting and itch like mad; if you scratch them, they pop open and spread sticky gold fluid all over and they just itch more. Look how far the redness extends…you should see the toe with FOUR bites on it!! Fire ant stings peak at 48 hours for me, so 6 hours after this photo was taken, I was begging Zach to PLEASE find the anti-itch spray so I could get some sleep! This is my Sunday view. 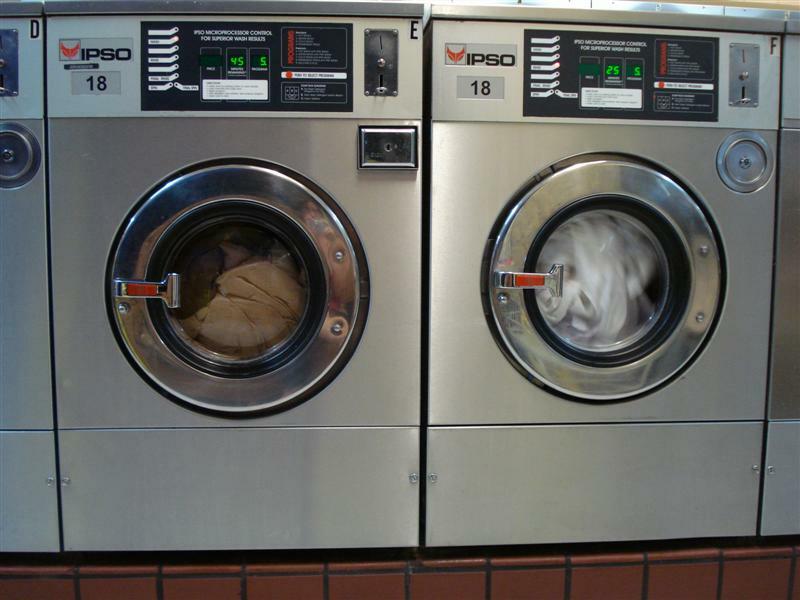 Looking at the washing machines, and eating bread and butter from Sandy’s Cafe. This rainy day photo was taken back at the beginning of the rainstorm that caused the flooding. 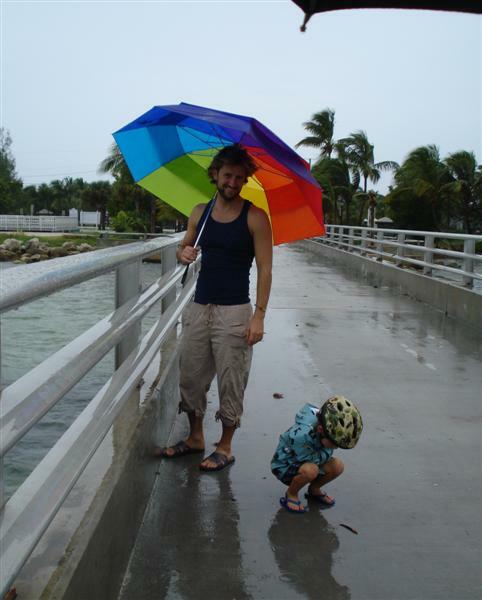 We were tired of being cooped up inside, so we took our umbrellas for a walk to the pier. 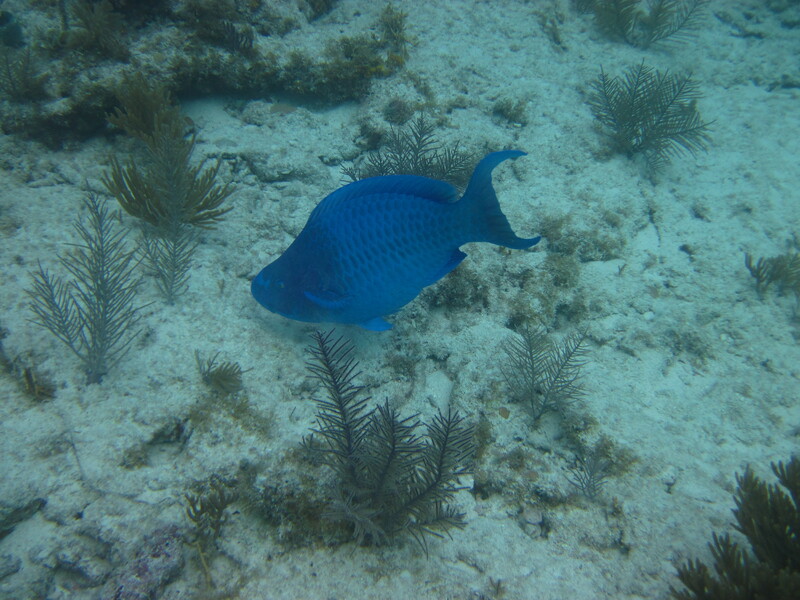 Despite the rain, the water was crystal clear, and we could see Parrotfish down amongst the rocks! Hmm, he is hard to see in this picture. Click here for someone else’s better photo. 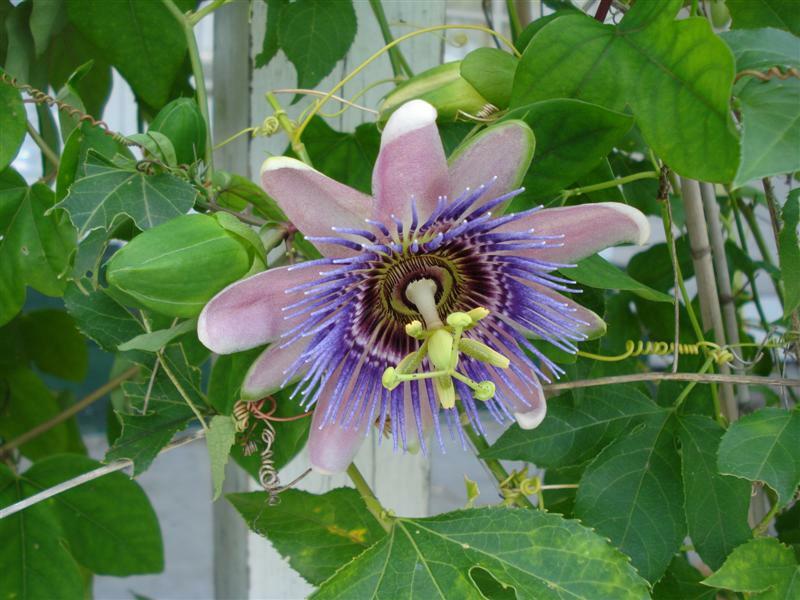 I pulled over on my bike to take a photo of this glorious passionflower vine in a pot. 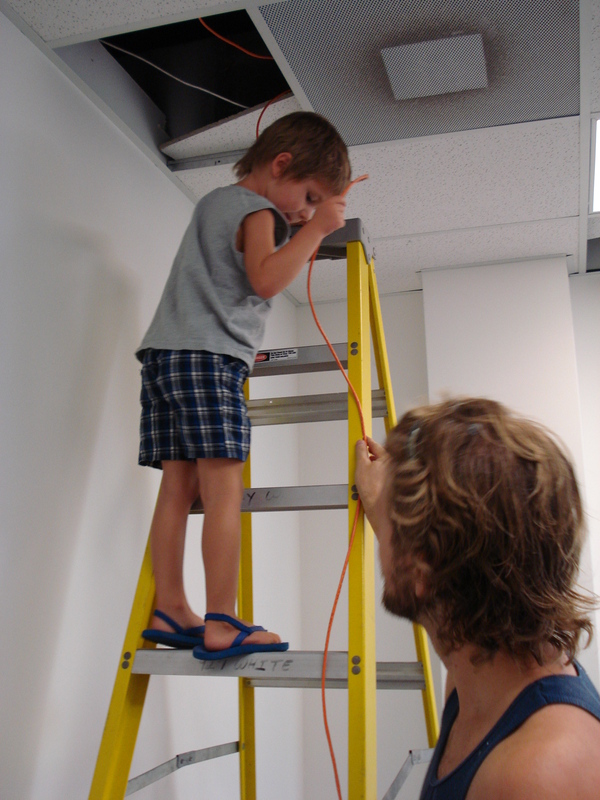 The Boogedy went to the new office with dad to help run network cables after Goombay Festival. This activity was deemed more fun than the festival itself, so much so that he forgot his tummy ache, which he’d had for days, and which the funnel cake and hot dog did nothing to stop. A few weeks ago I met a nice gentleman, George Fernandez of the Key West Butterfly and Nature Conservatory, at a business guild mixer. 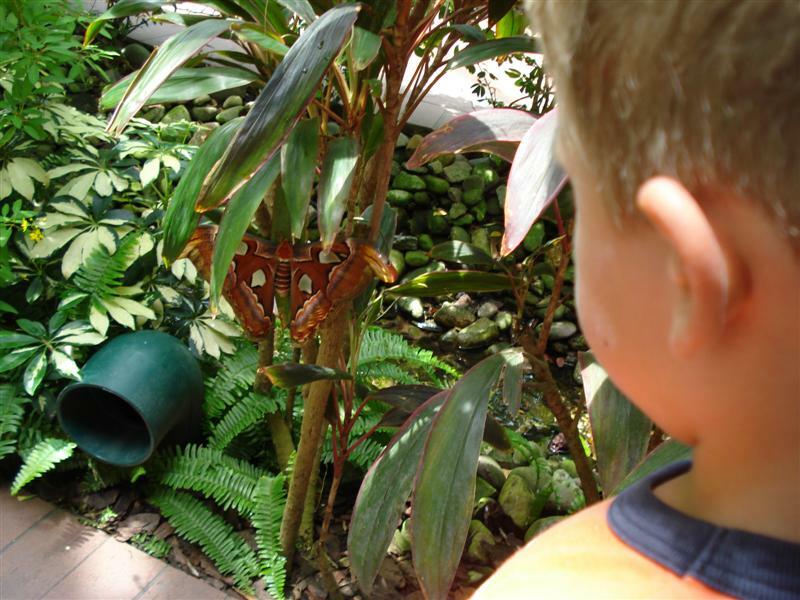 He invited our family to come visit the Conservatory as his guests. 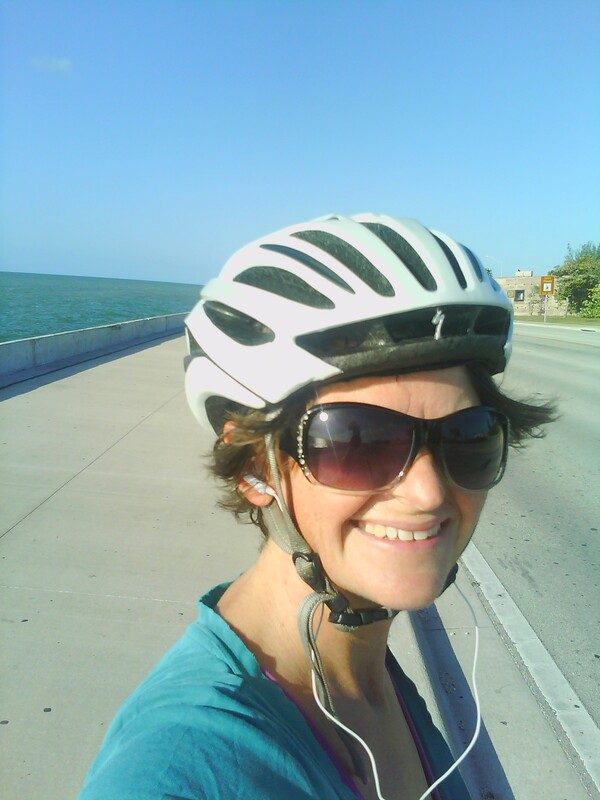 Yesterday looked like the perfect day to do that, so we hopped on the bikes and headed over. I can’t believe we’ve lived here 9 months and not yet visited. It was WONDERFUL! 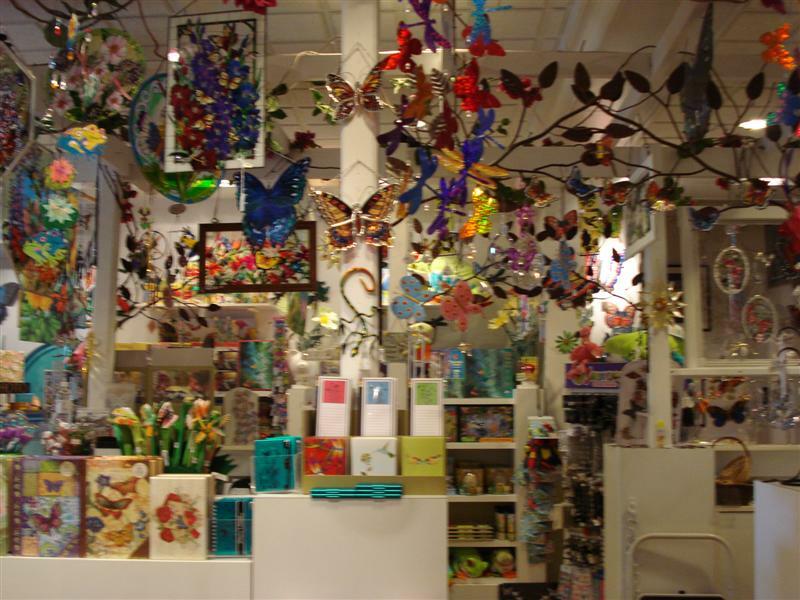 The gift shop had all things butterfly and floral, and I thought of my Aunt Susie the whole time, and of how much money she would have to part with if she ever stepped foot inside! 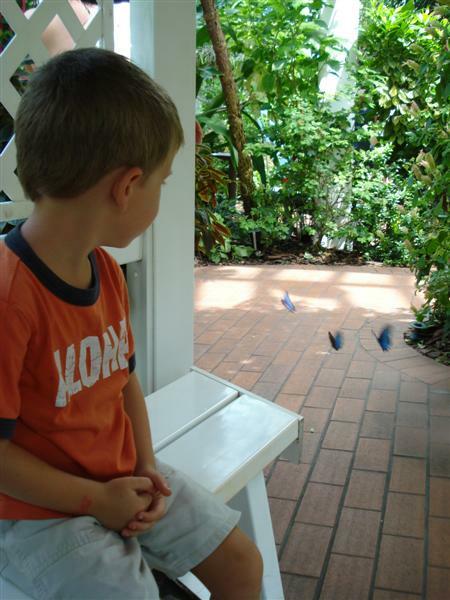 The blurriness of this next photo bothered me, until I looked at each photo I took inside the conservatory and saw all the butterflies blurring past my lens. Zach and the Boogedy waited patiently, but the Boogedy ended up being very upset that we couldn’t force one to land on him. I received a lecture on how, contrary to what dad says, butterflies do not bite you with their fangs and drink your blood. Umm. yeah. Then I found this article. 3. The gardener who told us that the garden is in a constant state of upgrade, or else the caterpillars would destroy EveryThing. 4. Pond with fish. 5. Resident Quail 6. 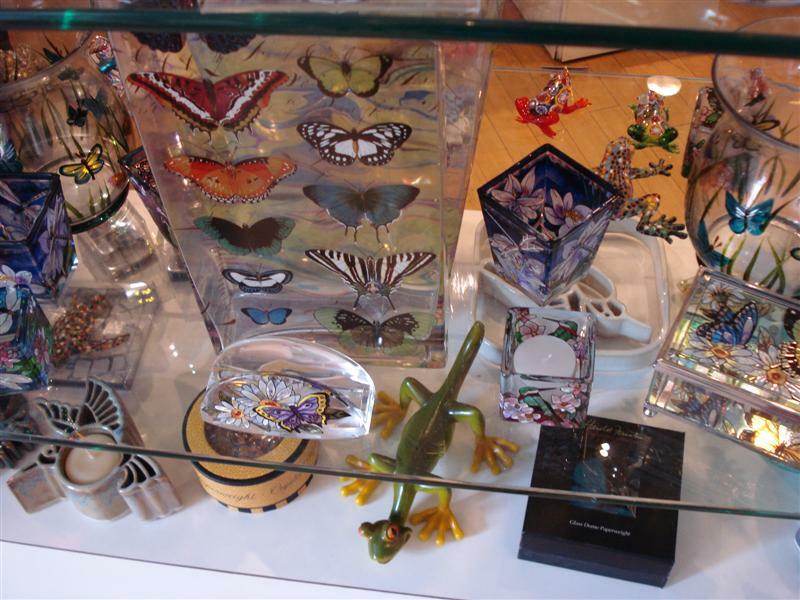 Butterfly Bridge under glass. 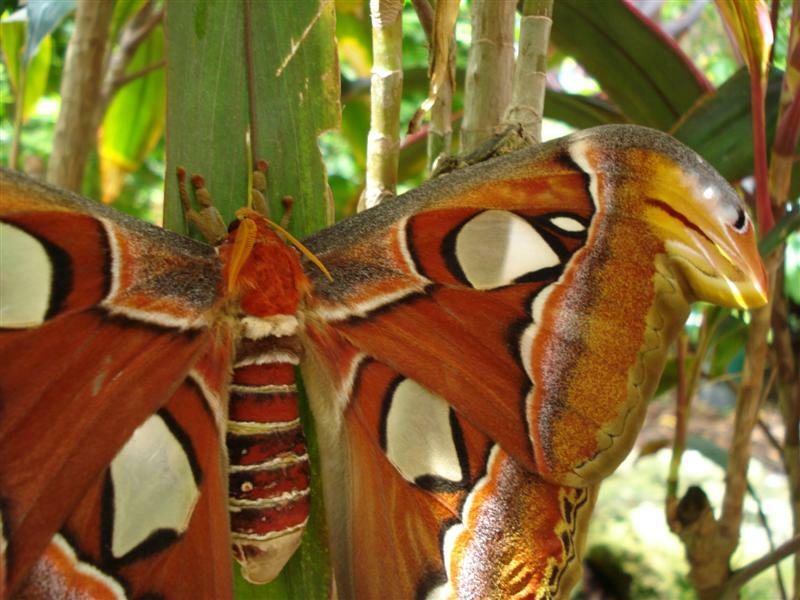 And just as we were leaving, we spotted the Atlas Moth, asleep on a plant. 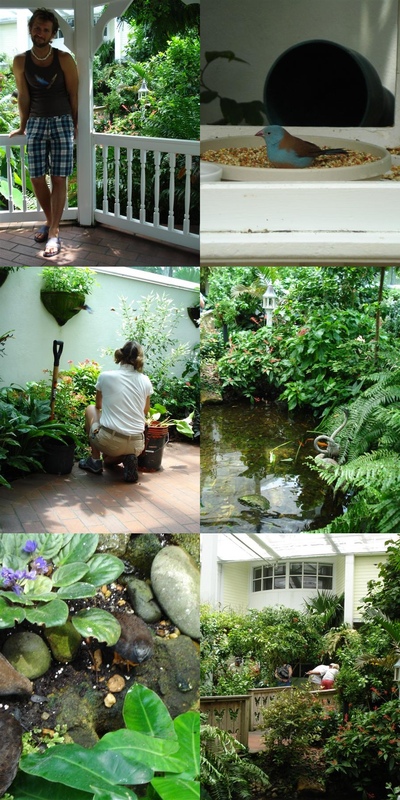 We had seen an atlas caterpillar in the front room of the conservatory, a smallish, nondescript whitish thing. But the moth itself was stunning, big as my spread hand. I got up close to see the orange antenna and noticed that the “white” spots were actually translucent, like a frosted shower curtain. I keep hoping that all these amazing sights will prompt my friends to come visit! For months now I have had an injured foot. On my second visit to a foot doctor, I was given some good taping techniques that are finally helping me to heal. 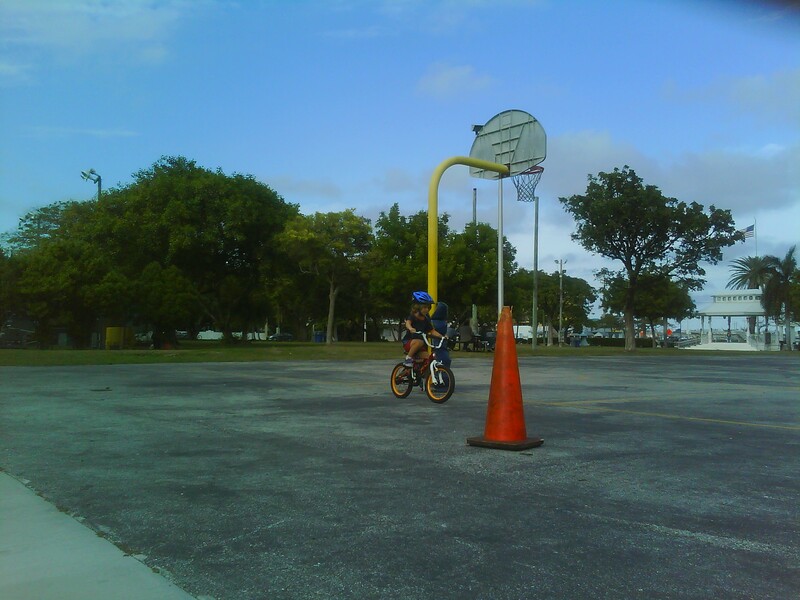 Before that, I was sticking REALLY close to home, except when Zach was available to push me on the tricycle. Here are some of the things keeping us busy. 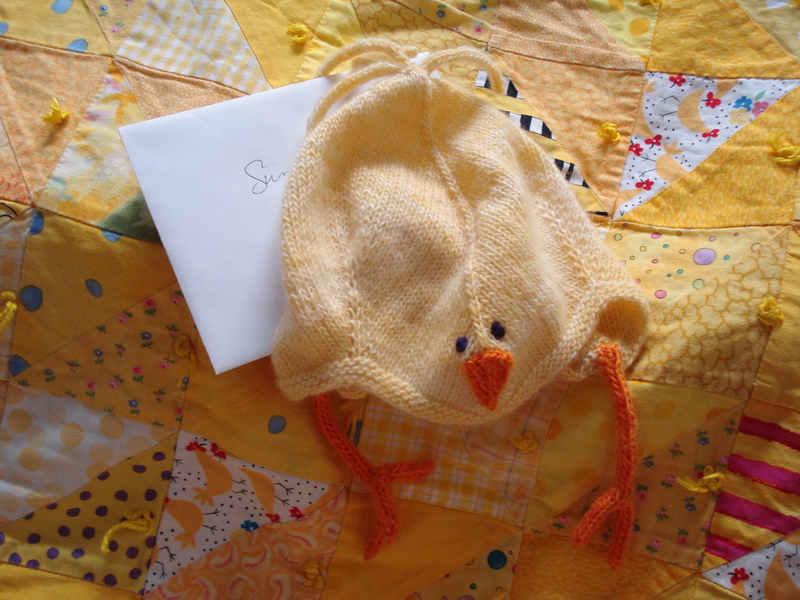 For Baby Claire, born a few weeks ago, I knit a tiny baby chick hat in the softest wool! I hope to have pics of the baby wearing it soon. Hint, Hint, Sunshine! 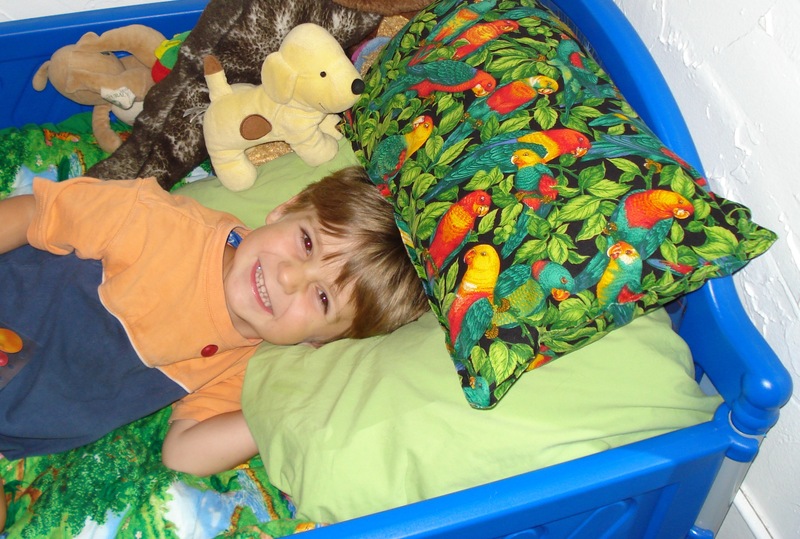 Boogedy earned a sticker for learning to make his own bed. A shot of our house gecko before he gets spooked and runs into his hole. 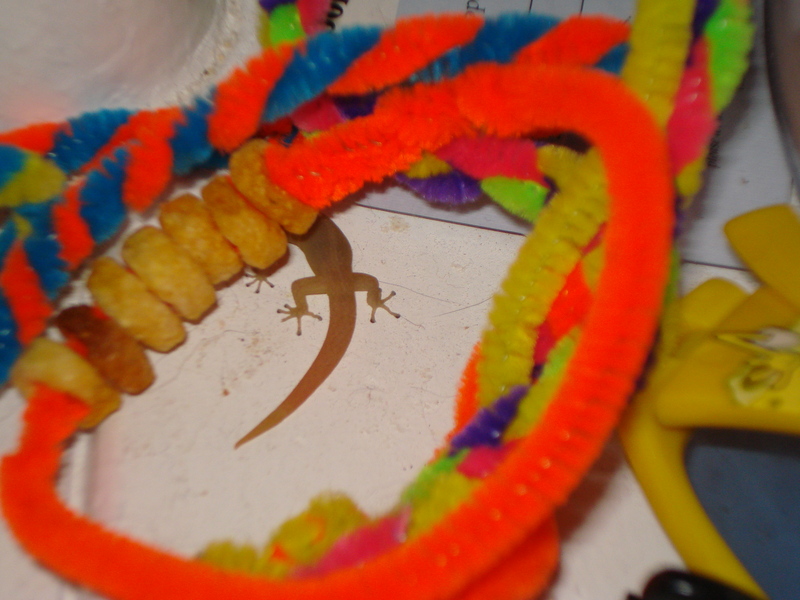 Is it a coincidence that this photo has cheerios for scale, or is that why he is here? 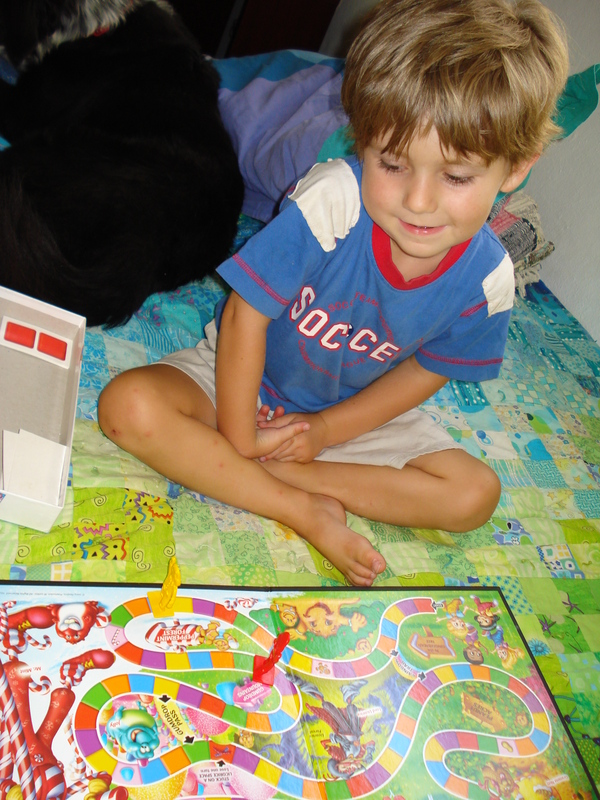 Forgetting that mommy is the Red guy and HE is the yellow guy. 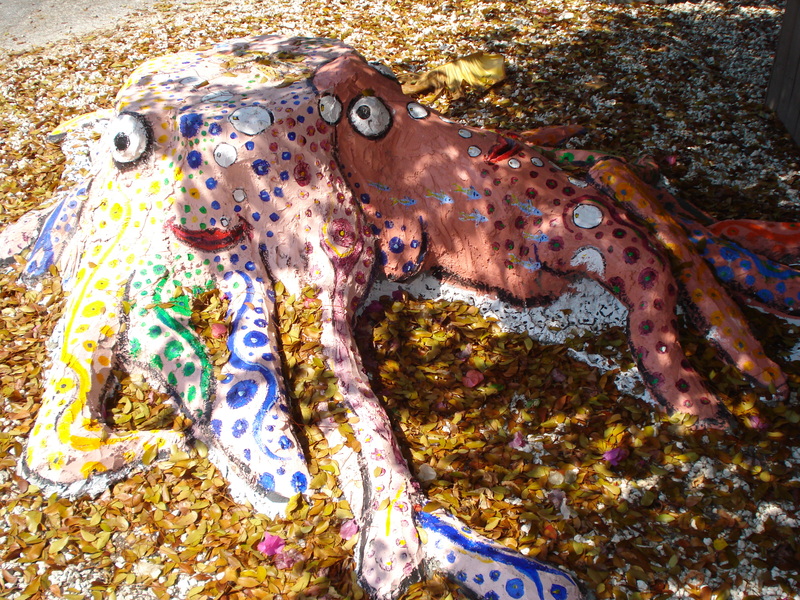 The octopus-and-squid-painted stump in my neighborhood. 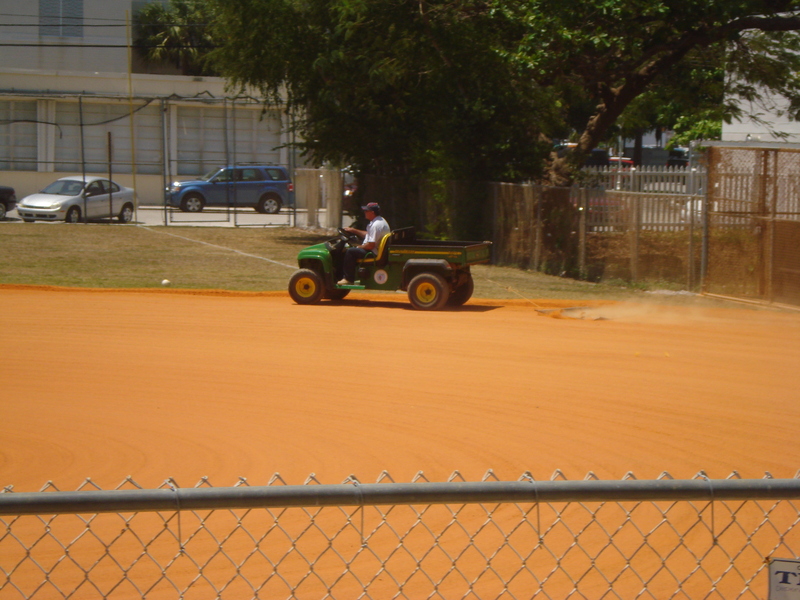 Watching the man at the softball diamond drive the tractor in ever-widening circles to smooth the red dirt. 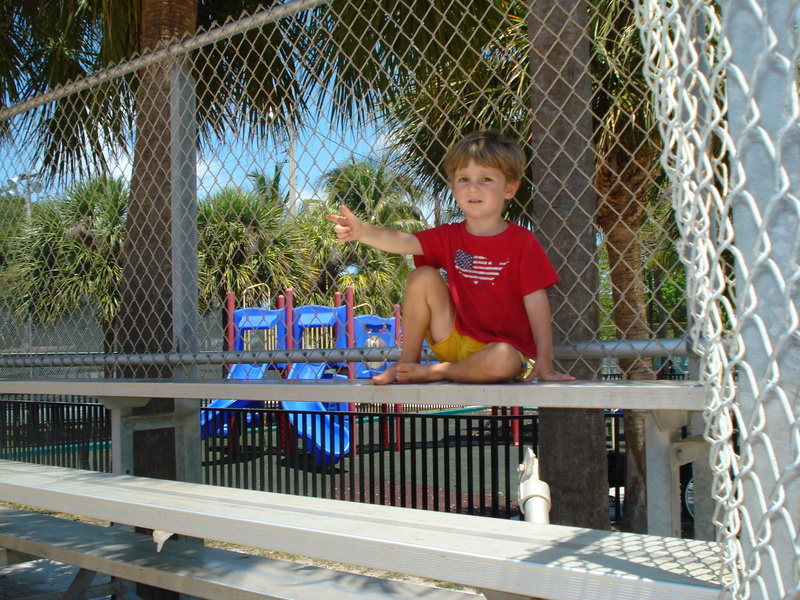 This activity (includes climbing up and down the bleachers) is good for 15 minutes of entertainment. 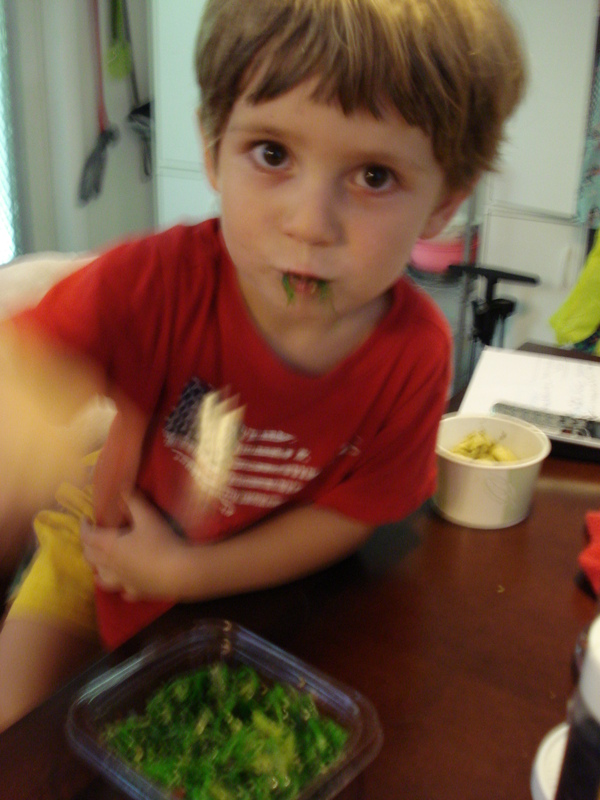 A special treat: seaweed salad from Faustos and some pesto tortellini.